Marc Remus is an award-winning German Neo Pop-Art painter and illustrator with exhibitions world-wide. He was educated in the United States, graduated with a BA in art and illustration from Art Center College of Design in Pasadena, CA, and lived in Japan and Central America for some years. He has travelled to more than sixty countries and visited over a thousand cities, of which he has painted over two hundred. His work has been featured on TV and in many magazines and newspapers in Germany, USA, and Mexico. During his studies in California, Remus took his first children’s book illustration class. His teacher inspired him to start writing and not just illustrating. The result was a picture book called Painting Brian, which led to the Magora series. Over a period of twenty years, Remus has developed this magical world based on places he has visited, people he has met, and things he has learned through his studies in acting, cultural Anthropology, and linguistics. 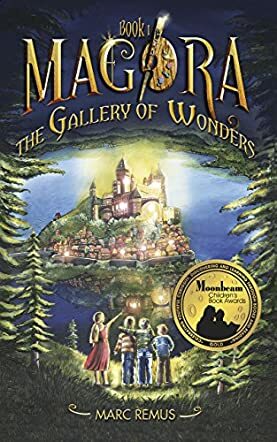 The Gallery of Wonders (Magora Book 1) by Marc Remus is a fantasy novel that centers around 11-year-old Holly O’Flanigan. Holly lives with her foster family, the Smoralls, who are uncaring to the point of being abusive towards her. Her only true relationship is with her grandfather, Nikolas O’Flanigan, who has always inspired rumours around town because of his strange and eccentric ways. In reality, as we come to discover, magic is in the air. When a fire ravages the town, Holly is devastated by her grandfather’s death as she looks up to him and wants to be an artist like he was. But to her surprise, soon after, she discovers an unusual, “magical” canvas and paintbrush left to her by her grandfather, which leads to a whole new world. In this world, Holly, along with her friends, can bring anything to life by painting it. As Holly enters this new world, enrolls in an art school, and helps to solve a mystery about stolen paintings, she also learns to love herself and find herself in the process. In that sense, this is a beautiful coming-into-your-own story. The Gallery of Wonders (Magora Book 1) by Marc Remus is a nicely written fantasy novel. Its theme of magic and creating life through art and painting is unique and appealing. I could almost imagine the vivid colors, brushstrokes, and paintings brought to life as I was reading this book. More importantly, this is a book about courage and about finding oneself through adversity. Holly’s character is well drawn and is universally appealing. The supporting cast of characters and plot make this an exciting and fun read. I would recommend this book for children and teenagers alike. The Gallery of Wonders: Magora Book 1 by Marc Remus introduces us to Holly, an eleven-year-old orphan who lives with an abusive foster family. She has only one close relative left, her Grandpa Nickolas O’Flanigan, an eccentric artist who perishes in a mysterious fire. Holly receives an interesting package and with her friends, Brian, Rufus and classmate Amanda, she is transported to Magora, a fantasy world that her grandfather has painted. In Magora, life revolves around painting and Holly has to prove that she is a Gindar, a highly-gifted person who, with a paint brush, can create anything she wants, especially people and animals. For someone who failed her art class, it is a daunting task, especially when she learns that the paintings in the Gallery of Wonders, their only gateway to the outside world, have disappeared. The Gallery of Wonders is the first in the Magora Book series written by Marc Remus. It is difficult not to sympathize with the story’s main protagonist, Holly O’Flanigan, a girl whose circumstances in life reminds one of Cinderella. The similarity, however, ends there and when her grandfather dies she is transported to Magora, a place that is both charming and fascinating. A shape shifter, a talking tree house and the Unfinished are just some of the characters that inhabit this enchanted world. In The Gallery of Wonders, Remus creates a truly unique and colorful world that vividly comes to life in the pages of his book and it is highly entertaining. And as Holly, like Rowling's Harry Potter, tries to make sense of her new life, we cheer her on and wish her all the best as we look forward to the next installment of the Magora Book series. When Holly’s grandfather dies, she’s certain that she’s going to be alone forever, stuck with a family that doesn’t care at all about her except as a personal slave. But when she stumbles across some amazing artifacts that give her special powers and introduce her to a land she thought was all make believe, she’s not sure what to do next. It’s going to take everything she and her friends have to discover the secrets of Magora and what it is about Holly that makes her so special to the ones that are seeking her. The Gallery of Wonders by Marc Remus is definitely a good read. I was interested in the characters because they seemed pretty realistic. The good characters drew you in and made you want them to succeed, but even the bad ones seemed pretty realistic too. I think there’s a good plot here and there’s enough going on to draw your attention. It’s all about the power of the paintbrush and you don’t have to be an artist to make it work. Just a little bit of magic can do it with Magora. I would be interested in learning more about these characters and following their adventures. There’s more in store for them and it’s something I would be interested to learn. I’ll be looking for the next book and I would recommend this book to my friends as well. Such a creative story! Must read. The Gallery of Wonders by Marc Remus is such a unique piece. In a way it reminds me of Cinderella, Harry Potter and the Chronicles of Narna but still it's very own and unique story. The book is about young Holly. Whose situation will literally break your heart. Living with her terrible foster parents you see a young girl dealing with very adult issues. When Holly loses her grandfather in a house fire we question how she will be able to continue on. He was her inspiration and the reason why she wanted to be an artist. This is where it gets interesting. Holly starts seeing questionable things and discovers that some magical yet confusing creatures and people that are after her. Holly finds out she is a part of something much bigger than her measly life at the Smoralls. She learns that the old mystical creatures and worlds her grandfather had told her about drawing were actually real. Holly and her friends Rufus and Brian, and Amanda literally fall into a painting of Hollys grandfathers after Holly finds a magical paint brush. In this magical world Holly finds herself facing issues she never could have dreamt of. Soon Holly faces the battle of finding an art theif who is threatening her ability to return to her real world by stealing the paintings that are your portals home. This is such a different kind of children's book. Facing troubling emotional issues but making it entertaining and captivating. The Author does a great job of describing scenes and characters without overdoing it. I was very entertained as an adult and definitely recommend this book. I’ve began reading this book with my niece who has always been unenthusiastic to the idea of reading in general, in an attempt to encourage her to improve her reading habits – and I must say that I am both surprised and impressed by how well-received it been so far. Finding a good book for her that she can become genuinely immersed in has proven to be usually one in a half dozen or so that I try, and I often have to rely on short books because she is a slow-reader So the fact that she (as well as myself) is enjoying “The Gallery of Wonders” so far even considering it’s relatively long length is what I personally consider to be a great testament to the author’s raw writing ability. We’re about half way through so far, I happily look forward to finishing it with her and continuing the series in the future. Author Marc Remus has done a fine job of penning a tale that any little kid would love. I read all of the books for approval before giving them to my young one and I have to say that this one is quite magical. The story revolves around protagonist young Holly O' Flannigan who has lost her parents, but is living with the cruelest foster family ever. Her artist grandfather is her last living relative, but he's been branded as being mentally incompetent. He's all that she has and just like him, she finds a joy in painting. But then things take a turn for the worst when a fire abruptly breaks out inside of her grandfather's house and he gets killed. No spoiler, but this is where the gem of this book lies. Remus takes imagination to new heights by creating the adventure of a lifetime inspired by art and his central character Holly. What I loved the most was the takeaway of The Gallery Of Wonders though, that just like in real life in the face of unfortunate circumstances, you have to learn how to move on, keep living and nurturing your gifts. I highly recommend. I bought this book as a gift for my kid and before presenting it I thought of having a go at it. After reading I am extremely satisfied with my purchase and I find this very interesting and mind gripping. The book flows through sorrow, mystery, magic and curiosity and I really enjoyed this. Holly is the protagonist of this tale and my kid loves the character very much. Marc Remus has created a wonderful story and what he explains are clearly visualized in reader's mind. He uses a clear and effective language for the purpose. I recommend this for all the children! Marc Remus has created an amazing land called Magora, weaving his love of painting into a tapestry of fantasy and reality. This tale is filled with action, adventure, and excitement as a young girl and her friends face dangers and grow into heroes. I recommend this book for all who love a great story. I can't wait to return to Magora for Holly's next adventure. A bit Cinderelli-Hogworts....BUT....having said that, Holly is an individual, and has individual thoughts and feelings. This intro book to the series felt very pat, things came together so easily. For these children to be accepted so easily into a school they know nothing about, and for them to accept this shift in their lives so easily...it's a little more than my brain can really accept. Holly? Sure I could see her trying to get away from sleeping on a mattress from a garbage dump, but not all of them had that life. So why do they want to stay? The middle and end of the book get a bit better, with an original mystery type problem/solution set. I like some of the NPC types that show up too, very personable. What a great book! You won't have any regrets diving into this one. Everything you could possibly ask for in a children's fantasy novel is here. Fun and whimsical characters, magical abilities, shape-changing trolls, dangerous and exotic creatures, and of course some characters with ill-intentions... This is just to name a few! All of this built on a great story made me eager to keep turning pages, I ended up finishing it in two sittings. It's even profound at times as it considers the line between fantasy and reality. I really think both young readers and adults can appreciate this. Overall a great book, it's super refreshing to see such original ideas in a genre overshadowed by the likes of Harry Potter. Words flow like an expensive Sable paint brush. The adventures that Holly embarks on are visually written and the message of completion of a painting hits home as a Visual Artist Major. Great Book. My hats off to the author - Marc Remus! Rated 5 Stars by my 9-year-old! My son, age 9, read this book. He asked me to post a 5 star review. He said he would like to give it 30 stars. My son and I started to read this together. But then he took it over early on. He loved the book and can't wait to read the second one. He also wants to donate a copy to his school library. I know parts of it are humorous as I heard him laughing many times. What I did get to read was very well written and enjoyable. Orphaned Holly travels to the world of Magora to study at Cliffony, a magical academy for those who create through paint. There are several plot holes and many questions left unanswered but for the first book in a children's series you couldn't get more magical. This is a charming children's book about a young girl who finds a way into a fantastic world full of whimsical characters. The book is very well-written, full of imagination amd creativity, which all middle grade children will enjoy. Highly recommended! My 9 yr old granddaughter started it on my kindle and had to go home. She was so eager to read more that she bugged her mother who ordered it so she could finish it. Then she went right on to the next book in the series. A wonderfully written tale, similar to predecessors stories, of a much put upon lead character, magical land, school, and grounds. Nice tale, had some unexpected twists,story for kids, very good and entertaining. The book was a magical read my grandson loved it. What a great read. Never put it down had to read it straight through. I definitely recommend this book for all ages. Kids loved it so did I. All of my favourite childhood stories into one! Marc Remus’ “The Gallery of Wonders,” reminded me of all of my favourite childhood books & stories blended into one - a combination of Cinderella and Harry Potter with a touch of Narnia…but written with a flair that is unique to Remus’ own personal style. I was heartbroken to read of her grandfather’s passing, however - this was only at the beginning of the novel and where the true adventure begins. Whimsical and magical, Remus’ takes us on a “coming of age,” adventure as young Holly learns what it means to be a true heroine (whether she wanted to or not!) as she faces creatures not akin to our world. I did manage to go on line to read a bit more spoilers and learned that this is perhaps the first of six books! I seriously can’t wait for the next instalments!